Pacific Rim: The Video Game is, quite obviously, the videogame tie-in for Guillermo del Toro’s summer movie about giant robots, called Jaegers, fighting giant alien monsters, called Kaiju. What better genre than the fighting game genre to depict these colossal fights between metal and monster? As it turns out, Pacific Rim: The Video Game for XBLA is everything you can come to expect from movie to videogame tie-ins – lack of inspiration included. Pacific Rim: The Video Game has a couple of modes to choose from. There are the single-player missions, of which there are two types: A regular “story” mode and a survival mode. The only difference being that in survival missions, the player’s health does not regenerate from round to round. There is also a multiplayer mode, with both local and online variants, and a customization mode. The customization tool is where players will be able to design their own fighters by first choosing a template to start from. These templates are one of the five default fighters available with the purchase of the game, including three Jaeger models and two Kaiju. They simply determine the fighting style that your customized fighter will take on. For example, Crimson Typhoon is a very spry, quick fighter, while the Leatherback Kaiju is slow, but packs a heavy punch. Everything in the customization menu costs experience points and those points are earned by playing the single and multiplayer modes. Each arm, the head, the body and the legs can all have their stats (things like hit points, attack speed, attack power and so on) individually upgraded with experience points, making it up to the player what their fighters’ strengths and weaknesses are. It should be noted that certain options in the customization menu are not available unless you purchase downloadable content. Keep in mind, this is a $10 game upfront. These downloadables can be aesthetics like new color options for your Jaeger or simply more experience to speed up the process of upgrading your fighter. However, most of the fighter templates are straight up not available unless you purchase them as DLC. As mentioned earlier, five templates are available with the game, but an additional ten fighter templates are only available through a real-money transaction. All of this is added together to form a “total evaluation” number for the fighter (think metascore). Total evaluation is never explicitly defined and its only purpose seems to be a ranking system for fighters in online matches, though, finding a player with a similar total evaluation is completely optional. In fact, you may join a lobby (or create your own), only to find out that you don’t have a fighter in the total evaluation bracket that they are looking for, wasting their time and yours. The single player mode in Pacific Rim will consume, at most, four hours of your time; that is ,unless you are feeling masochistic and want to attempt to earn a “Gold” ranking on every mission. Missions can be replayed as many times as you wish to earn more experience, but playing against actual players just seems like a better use of your time, if you can actually find a match (creating my own match seemed to be the best way to go). 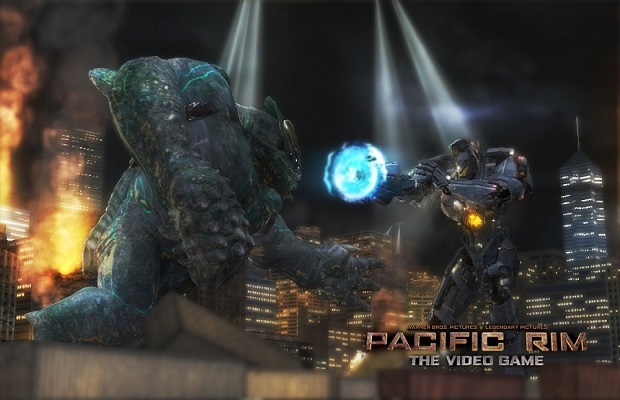 Having known prior to playing Pacific Rim that del Toro had made comments about wanting “to create a [Pacific Rim] game properly and take proper time,” skepticism pervaded my consciousness in playing Yuke’s tie-in to the fantastically fun summer movie. So, while del Toro seems to have plans to create a “proper” Pacific Rim videogame, Pacific Rim: The Video Game is not that game. Instead, it is a barely competent fighter that hides far too much of its content behind an additional pay-wall all for the sake of promoting the real medium this property was meant for, film. Pacific Rim: The Video Game was developed by Yuke’s and co-published by Yuke’s and Warner Bros. Interactive Entertainment. An XLBA copy was provided by the publisher for reviewing purposes.